I consider myself a pretty lucky person. I have a wonderful family, great friends, enough home improvements projects on my list of things to do to keep me out of trouble, and a job I love. Still, there are times when life gets a little crazy; and sometimes it seems like there’s a lot of commotion and noise in the world that’s unsettling and troublesome. Every once in a while I have to tune out all that noise and find my own way to bring balance back into my life. Portrait of a Lady at a Pianoforte Holding a Manuscript, by Adele Romany. For Mary Bennet, in my novel Mary and the Captain, her way of coping when things looked dark was to play the pianoforte. Playing music was the one satisfying outlet she had for expressing her emotions when things went wrong. Were Mary alone she would have given vent to her feelings with crashing chords in a storm of correct and incorrect notes; but despite her heightened emotions, she had enough mastery of herself to know that she could not play the beautiful pianoforte at Netherfield as she was used to playing her old spinet at Longbourn. She was compelled to play with restraint, yet she still found solace in her music. Soon she began to feel better and her music softened in turn. My method for drowning out the noise and bad news in the world is much different from Mary Bennet’s. I take a break. I unplug for a day or two—no television, no social media, and, most importantly, no political ads! That’s what I did last week; and I have to say, it’s surprising how much less stress I feel by simply “getting away from it all” and spending some quiet time with family, friends, and a couple of books. What about you? Is there a place you escape to in order to shut out the world’s noise? A place of quiet and peace where you can hear yourself think? Or is there an activity—like Mary’s piano playing—that calms you and helps you feel centered? I hope you’ll leave a comment and let me know how you cope when technology, world events, and life in general get to be a little too much. And if you’re interested in learning more about my Jane Austen inspired novel Mary and the Captain, just click on the book cover. It’s October! That means it’s time for me to buy bags of Halloween candy and pick out all the Almond Joy bars so I can hide them to eat later in private. October also means getting ready to dress up in costumes, tour haunted houses, and choose the foggiest night of the month to whistle through a graveyard. A crush of fashionable Victorians at Hyde Park. In reality, I’m not spooked by graveyards. In fact, there’s a graveyard in the heart of London that has always intrigued me. Marble Arch, Hyde Park, near the pet cemetery. It’s a graveyard that was created specifically for pets. It dates back to the 1880s, with grave markers that span three centuries. Hyde Park Pet Cemetery, photographed early 19th Century. Since I’m an animal lover who has all too often suffered the loss of a beloved pet, I find myself drawn to the Hyde Park cemetery. If I ever doubted that I had anything in common with the Victorians, all I have to do is look at the grave markers to feel a kinship with them and the devotion they had for their furry (or feathered) friends. A grave marker for Zulu, at Hyde Park pet cemetery. The cemetery has hundreds of markers, all loving tributes to Brownie, Jack, Spot and Josie. There are hundreds of pet cemeteries around the world; but for me, there’s something special about this pet cemetery tucked away near a corner of Hyde Park. It’s a well-cared-for, loving tribute to generations of mankind’s beloved animal companions. And there’s nothing spooky about that. I’m a slow writer. I freely admit it. There are times when I envy other writers who can produce four or five (or more!) books a year, and have them all hit best-seller lists (an indication that those high-producing writers are publishing quality stories). But I’m the proverbial turtle when it comes to the writing race. Still, I like to document my progress. I keep a journal open on my desk, and every day I write down things I do related to my writing career, like the number of new words I write each day, or the research I conduct. And yes, I use stickers to show when I’ve met a daily goal. I’ve come to rely on stickers. They keep me focused. They motivate me. I hate having to turn a page in my journal if I haven’t first applied a sticker on it. To me those stickers validate that I’m doing my work and meeting my goals. The cover has a soft, suede-y feel. I can’t wait to begin writing in it (although I think I should finish filling my current journal first). Journals and pens and stickers may not seem like very much; but combined together, they help make writing fun. They’re also my way of rewarding myself for plowing ahead, meeting my goals, and writing my book . . . no matter how slowly I do it! It’s February. I know, I can’t believe it either. But even though time seems to be flying by, I’m really looking forward to a new month, since everything I hoped to accomplish in January didn’t quite happen as planned. On January 4th I came down with the flu, and it really took me out of commission for about two solid weeks. I needed a third week of home confinement just to ensure I looked presentable before going out in public again. Unfortunately, I didn’t get much writing done during the month. But some good things happened, too . . .
First, I began plotting a new Jane Austen inspired story that centers on Kitty Bennet. Lydia (Julia Sawalha) and Kitty Bennet (Polly Maberly) in BBC’s 1995 production of Pride and Prejudice. In Austen’s Pride and Prejudice Kitty is a minor character, who never really gets a chance to show readers who she is. In fact, Kitty is really little more than a follower; her personality is constantly overshadowed by that of her younger sister Lydia. I’ve always been intrigued by Kitty (just as I was by her sister Mary, who also got short-shrift in P&P). I’m hoping this new story will give Kitty a chance to shine and find a Happily Ever After of her own. I’ll keep you posted in my progress. I absolutely love going to the theater and seeing live performances; it’s even better when I can make an evening of it by having dinner at my favorite restaurant before the show. But before I put on my best clothes and head downtown for a night out in Denver, I have some serious writing to catch up on. I have publishing goals to meet this year and I’m already behind on my daily word counts. So today I’m going back to work with a vengeance and, if everything goes right, I’ll soon be able to report to you on my progress. In the meantime . . . Happy February! I hope it proves to be a great month for you! In my last post I described an old English tradition called Whip Dog Day. It’s one tradition that is best forgotten. Today I want to talk about a twentieth century American tradition that is best remembered. It’s celebrated every year throughout the month of October. I’m talking about Adopt a Shelter Dog Month. This is a celebration I can really get behind. I’ve had several pets during my long life and almost all of them joined my family after I found them at a shelter. Let me introduce you to a few of my family members who came from dog shelters . . . This is Byron, a corgi/basset hound mix, who is probably the smartest dog I’ve ever known. He knows lots of words in Human, which is impressive when I realize I don’t know a how to say a single word in Dog. He, too, was a shelter dog. He’s not as smart as Byron, and he had some very concerning behavioral issues when I first brought him home; but once he settled in and learned to trust me, I discovered something I hadn’t expected: he’s unfailingly happy all the time. An added bonus: if you toss a squeaky toy to him, he will be your devoted slave for the rest of his life. Based on my photos, you may have noticed some trends in my preference for pets. I tend to adopt dogs with black fur, because I once read that black dogs were less likely to be adopted than dogs with lighter hair color. I tend to adopt dogs who have been at the shelter the longest. They are more likely to have medical or behavioral issues that make them less desirable for adoption. And that means they are more likely to be put down than other dogs. I also tend to adopt dogs that no one else seems to want. So far, it seems no one wants dogs with satellite dishes for ears, but I do. You may also notice that I have a predilection for naming pets after 18th Century Romantic poets. By all rights, the next dog in line for adoption should be named Shelley, just to complete the triad. That was my plan . . . But then something unexpected happened. Lacy came into my life. Lacy, too, was a shelter dog when my cousin adopted her a few years ago. But when my cousin fell ill and had to be hospitalized, Lacy came to stay with me. It was supposed to be a temporary arrangement; but a few days soon turned into a few weeks, then months, as my cousin remained hospitalized. Unfortunately, my cousin never left the hospital; she passed away last February, and Lacy became a permanent member of my family. Lacy blends right in, and since her arrival, I’ve realized that my dogs and I have a lot in common. We’re all motivated by treats and praise. We all have short legs. And we all hate the vacuum cleaner. But the key thing my dogs and I have in common is that we want to be loved, and we have plenty of love in our hearts to give back. With those kinds of benefits, there’s no reason anyone should believe they have to wait until October rolls around again to adopt a shelter dog. I adopted Byron in the month of June. Keats came home with me during May of 2015. And Lacy became mine in February of 2016. So I can say from a place of experience that any month is the right month to bring a new pup home. So even though today is the last day of October—and the last day to celebrate Adopt a Shelter Dog Month—there are plenty of reasons to visit your local animal shelter in November (or any other month) and find that special dog just waiting for you to take him or her home. I’m tempted to go visit my Denver shelter in the next few weeks myself, just to see if they might possibly have a dog that would make a good addition to my own family . . .
. . . A small dog with black fur who wouldn’t mind answering to the name Shelley. Winner of the Netherfield Library Prize Package Giveaway! Congratulations go to Anita (alp1788) who won the Netherfield Library prize package I offered exclusively to readers of Austenesque Reviews. Anita, your prize package is already on it’s way to you. Congratulations! Win a Netherfield Library Prize Package! Last week I had the good fortune to visit Meredith Esparza’s blog, Austenesque Reviews, where Meredith and I talked about my new book, Mary and the Captain. This was my first appearance at Austenesque Reviews, and I was so excited to be there! I decided to commemorate my visit by offering a giveaway to Austenesque readers! The best part is, there’s still time for you to enter to win the prize package, inspired by items Mary and Captain Bingley found in the library at Netherfield Park. • A wax seal set you can use to seal your own letters and cards, just as Mary and Robert set their seal to the letters they wrote together in the library. • A pair of desk scissors inspired by the very scissors Kitty lent Robert to open an important letter he received. • A modern-day ballpoint pen bearing Jane Austen’s autograph, perfect for writing your own clever correspondence. • A red-and-white ribbon bookmark, so you’ll never have to worry about losing your place in the story. • A signed copy of my book, Mary and the Captain. • A lovely Pride and Prejudice inspired bag to carry your copy of Mary and the Captain wherever you go! The best part is, there’s still time to enter the drawing! 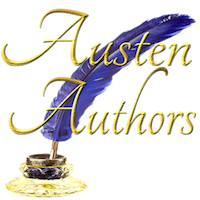 Just click here to leave a comment on my post at Austenesque Reviews, and you’ll have a chance to win the prize package. Hurry! The last day to enter is August 30! Today I’m on Austenesque Reviews to talk about Mary and the Captain and announce a fabulous GIVEAWAY of prizes inspired by Mr. Bingley’s Netherfield library. Join me there! Mary and the Captain is now available in paperback! Good news! Mary and the Captain is now available in paperback on Amazon. You can also find Mary and the Captain in print at BarnesandNoble.com beginning next week. I’ll post an update here as soon as I have an exact date. And if you prefer to read Mary and the Captain on your favorite device, you can download it from most major e-book retailers, like Inktera, iTunes, Barnes and Noble Nook, Scribd, Smashwords, and Kobo. I hope you enjoy the book! Any questions? Feel free to leave a reply below. I love to hear from readers and always respond as soon as I can, so let me know your thoughts.